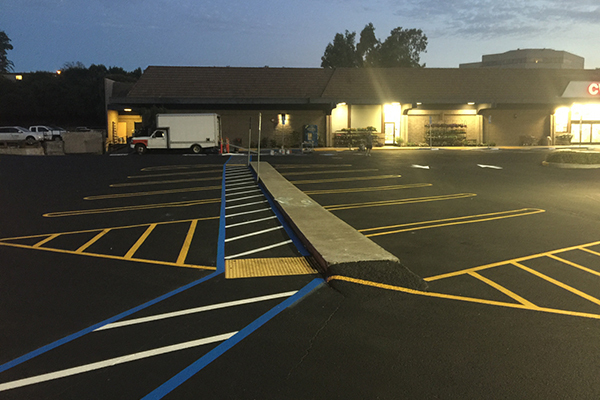 Stripe A Lot can handle all aspects of parking lot striping and marking for your parking lot or garage, including accessible routes, crosswalks, stops and limit bars, hashing, and speed bumps, plus painting of curbs, fire lanes and roadways. Our services include helping you with your parking lot design and maximize your parking areas. We provide an expert layout skills and marking of straight lines (no bananas!). We recommend using a quality marking product by Sherwin Williams (Set-Fast). Using the right traffic paint allows us to guarantee our work from flaking, hot tire pick up and normal wear for one full year. By using high quality paint and materials, you can rely on our work for years to come, without driving up the cost of striping your lot. Restripe your faded lot stalls or add new markings and lines to your parking lot with Stripe A Lot. We also provide ADA compliant parking striping and signage to keep your lot up to standards. We handle parking lot striping projects, both big and small. To get a free quote for your parking lot striping project, please call 925.250.8930 or contact us today.